Waterton Lakes National Park in Alberta together with Glacier National Park in Montana makes up the Waterton-Glacier International Peace Park. It is the first and only such park in the world. In 1895, this beautiful mountainous region was declared a Canadian National Park and the year before the United States had established Glacier National Park in Montana, both parks had a common bond, they shared the Canada-US Border. For years local people on both sides of the border had been asking for the both governments to establish an international park. The idea made sense, as the Upper Waterton Lake is located in both countries. In 1932 with the help of the Rotary Clubs of Alberta and Montana, the two parks were declared the world’s first International Peace Park. This Peace Park represents the need for nations to co-operate where sharing of resources and ecosystems is a must. UNESCO designated the Waterton-Glacier International Peace Park a World Heritage Site and both parks and surrounding lands are an International Biosphere Reserve. The mountains in Waterton Lakes National Park have a distinguished colouring and are the oldest in the Canadian Rockies. During the age of mountain building, a very thick sheet of rock known as the Lewis Thrust slid on top of underlying younger rock layers. This means that rocks 1.5 billion years old cover the 60-million year old prairie shale. Old rocks cover new rocks. Here, where the rolling prairie land meets the mountains, is a very unique region in Canada. This meeting of prairie and mountain generates a great variety of flowers, plants and animals. Nature’s handy work is seen in the lakes, streams waterfalls and glacial formations throughout the park. Compared to Banff and Jasper National Parks, Waterton Lakes is quiet and uncrowded. It offers spectacular scenery, an abundance of wildlife and numerous outdoor recreational activities. It’s open year round and truly an unsurpassed rare ornament in the Canadian Rockies, situated in the southwestern corner of the Alberta and bordering British Columbia. Coming in from the east this mountainous area can be seen for miles away as it rises on the horizon over powering the flat prairie land. 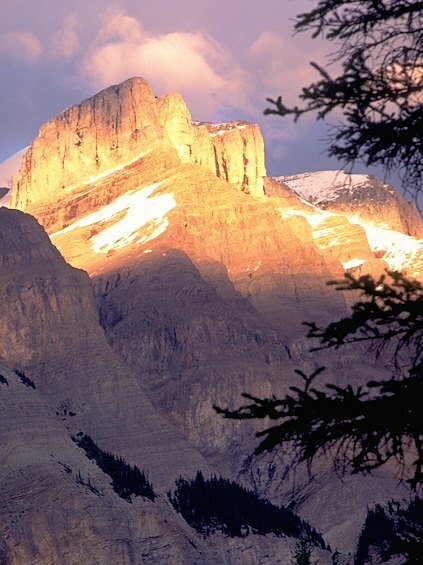 There are no foothills to prepare you, as there are in both Banff and Jasper National Parks. One of the park’s focal points is the three Waterton Lakes. The largest of the three is Upper Waterton that is 11 kilometres (7 miles) long, less then 1.5 kilometres (1 mile) wide but reaches a depth of more than 135 meters (450 feet) in spots. This is the deepest lake in the Canadian Rockies and is very windy. The chinook winds that come in winter and spring keep the mountain fronts snow-free where deer, elk, sheep and goats can graze during the winter months. This region of Canada has remained the same for centuries. The wildlife and climate first attracted the aboriginal people to this area. The evidence can be found in more than 200 archaeological sites that have been found in the park, many dating back 10,000 years. Very few European explorers and fur traders settled here, as there was neither a railroad nor a road in the region. Because of this remoteness, Waterton Lakes escaped the building pressure of other National Mountain Parks and still remains a quiet remote vacation spot. 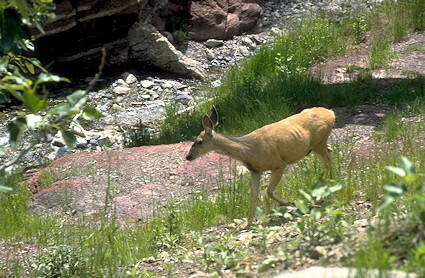 Some of the larger species of wildlife include Elk, White Tail and Mule Deer, Big Horn Sheep, Mountain Goat, Moose, Caribou, Wolf, Coyote, Cougar, Black Bear and Grizzly Bear. Waterton Lakes National Parks, covering an area of 525 square kilometers (200 square miles) is not a large park, but offers the outdoor enthusiast many opportunities. Visitors are invited to enjoy the more than 200 kilometers (160 miles) of hiking trails that make their way through the valleys, along the lakes, rivers and streams. Go back packing into the mountains, canoe and kayak the lakes. Enjoy mountain biking, horseback riding, swimming, fishing and golfing. In the winter the park is popular with cross-country skiers and snowshoers. 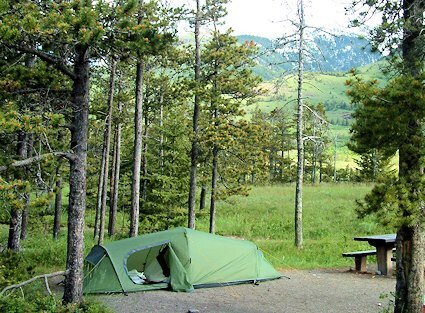 Get close to nature with a visit to Waterton Lakes National Park.